North Carolina State University’s College of Veterinary Medicine is ranked third among the nation’s 30 colleges of veterinary medicine in the current survey by U.S. News and World Report. In the magazine’s rankings for “Education: Graduate Schools–Veterinary Medicine,” the University of California–Davis is first with a 4.5 score, Cornell University is second with a 4.1 score, and NC State and Colorado State tie for third with a score of 3.9. For U.S. News and World Report’s complete ranking, click here. According to the magazine’s stated methodology, the rankings are based solely on the results of peer assessment surveys sent to deans, other administrators, and/or faculty at accredited degree programs or schools in each discipline. All schools surveyed in a discipline were sent the same number of surveys. Respondents rated the academic quality of programs on a 5-point scale: outstanding (5), strong (4), good (3), adequate (2), or marginal (1). They were instructed to select “don’t know” if they did not have enough knowledge to rate a program. About the NC State University CVM. With the graduation of its first class in 1985, the NC State College of Veterinary Medicine is one of the younger veterinary programs in the country. Despite its relative youth, the CVM has gained international recognition on the strength of its teaching, research, engagement, and patient care efforts. The College has one of the best faculty-to-student ratios in the U.S. and a highly-regarded House Officer program. College faculty were instrumental in helping establish and continue to participate in the North Carolina State Animal Response Team, a program that serves as a national model for animal disaster preparedness and response. The research component includes the Center for Comparative Medicine and Translational Research. The CCMTR is a community of more than 100 scientists from five NC State colleges who are involved in collaborative ”One Medicine” studies with government, private, and other academic researchers to advance knowledge and practical applications that improve the health of animals and humans. 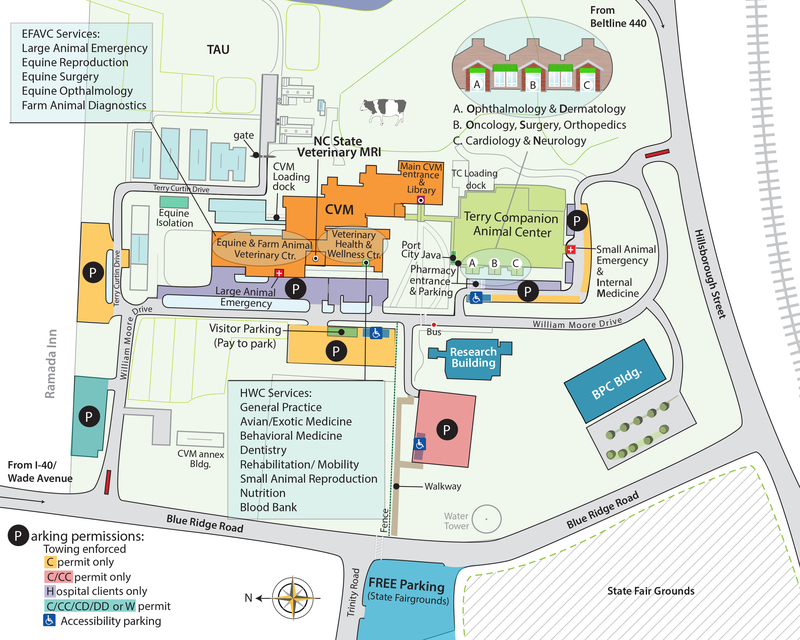 Located on 180 acres near downtown Raleigh, the College encompasses 20 buildings on the main Centennial Biomedical Campus. Instruction is in three departments—Clinical Sciences, Molecular Biomedical Sciences, and Population Health & Pathobiology. In addition to the four-year Doctor of Veterinary Medicine degree, there are programs leading to master and doctoral degrees in several areas with numerous opportunities for specialization. The House Officer Program provides one- to three-year internships or residency training in more than 20 clinical specialties and the innovative Clinician Scientist Training Program prepares veterinary researchers. The CVM is unique among veterinary colleges with an on-site Teaching Animal Unit that operates as a working farm and aids in hands-on instruction with large animal medicine and exposes students to basic agriculture principles and farm technology. More than 23,000 patients are diagnosed and treated annually by Veterinary Hospital clinicians and the Randall B. Terry, Jr. Companion Animal Veterinary Medical Center is a major referral center for veterinarians from throughout the Southeast. These patients are often seriously ill and require the best that veterinary medicine offers. This quality care is delivered with the utmost compassion for patient and owner, a hallmark of the hospital. The patient case load also allows for instruction and the opportunity for clinical trials that advance animal health and well being. Since its inception, the CVM has chosen to put its focus on six specific program areas: Companion Animal Medicine, Food Supply Medicine, Biomedical Research, Ecosystem Health, Equine Medicine, and Animal Welfare. Through these six areas, the NC State CVM prepares the next generation of veterinarians and veterinarian scientists, conducts bench and clinical research to solve animal and human health problems, addresses critical ecosystem and public health issues, helps protect the U.S. food supply, and promotes a clearer understanding and appreciation of the ramifications related to the growing human-animal bond that is at the center of these concerns.